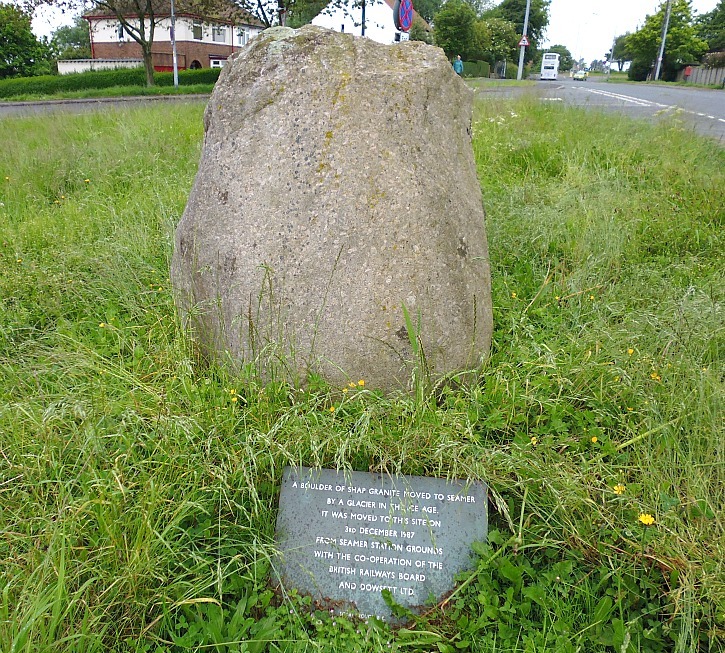 The Crossgates Stone near Seamer railway station. Os grid Reference: TA 1268 8163. 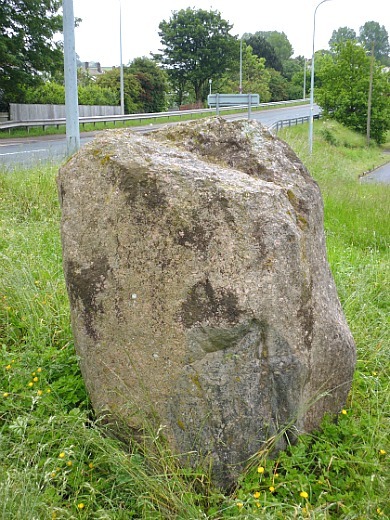 In a grassy area at the top of Station road, Crossgates, Seamer, some 3 miles south-west of Scarborough, stands a solitary glacial erratic boulder that is known to have been deposited by a glacier many thousands of years ago. Local legend says the boulder originated from the Lake District, or did it? The large stone has been a landmark here for many years, but originally it stood a little further down the road, and there may have been other glacial boulders in this area. The village of Seamer is about 1 mile up the road, while Scarborough is 3 miles to the north-east on the B1261 and A165 roads. The Crossgates Stone at Seamer near Scarborough. 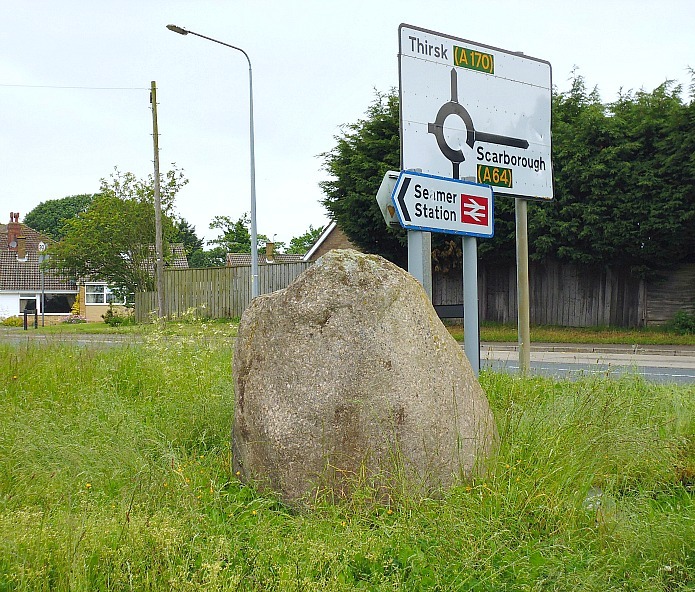 This large, solitary granite boulder is around 6 feet in height and double that in girth, and is set well into the grassy ground at the top of Station road (at the junction of the B1261 Scarborough road and Station road), but it had originally stood in the yard of Seamer railway station at the bottom of the road where it had resided for some considerable time. In 1947 permission was granted for the boulder to be moved up the road from the old railway station. The information plaque alludes to the fact that the stone was carried here by a glacier moving south-eastwards from Shap in Cumbria at the end of the Ice-Age thousands of years ago, but could it in fact have been carried south from Scotland or maybe Northumbria instead? On the way south it apparently got dislodged in a natural gap in the higher land at either side – the B1261 and A165 roads to Scarborough now run through this naturally-formed gap. So it’s ‘highly probable’ that there were other boulders in this area, though where they are remains something of a mystery. Categories: Glacial Erratic, Standing Stone | Tags: The Crossgates Stone at Seamer in north Yorkshire | Permalink.